I sense what I read here is a wonderful division of the BC and AD period. Old testament followed by a new covenant and women in new covenant are most certainly regarded highly as the writers say. As I look at the Muslim world today, Frank, I find a religious society which places women in the lowliest of ranks. This makes me wonder so much why some liberal forces are so intent upon “protecting” the Muslim agenda. Christianity, through the actual teachings of Christ, places woman on level playing ground, equal with men, and equally capable of sharing the Good News with others. One of my favorite stories is the Woman at the Well. Not only does Jesus accept water from her, He TALKS with her, recognizing and forgiving all her sins in one breath. She knew she had met the Messiah, and her joy could not be contained! A lot of strong women are portrayed in the Bible. Jesus even gave favor to the women he encountered in the Bible. Mary was the chosen one to give birth to Jesus….it didn’t just happen by a baby simply appearing. The woman was CHOSEN, hence given favor. 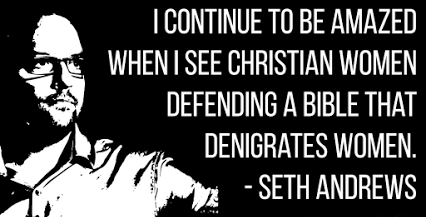 I feel bad for you, Seth.